During the Renaissance period, the Balbi family business evolved from the trades to the import and export of a number of goods, and ultimately, to international banking. Prior to the 1400s, the Balbi family was in the rope making and tanning business. During the 1400s their business expanded to include the import and export of silk in the Middle and Far East, through Messina, and Sicily. With money earned in the silk business, the family acquired a large amount of real estate in Genoa upon which they would later build their palaces, the Jesuit College and Francesco Sarverio Church. In the 1500s their business expanded to include other products such as velvet, wool, sugar and steel. Between 1565 and 1605 wool was the major product the Balbi company imported and exported, and they also sold wool and grain wholesale in trade fairs throughout Europe. They established companies in Madrid, Antwerp, and England. Many family members participated in running the business, and although fairly independent, operated under the umbrella of the Balbi company. In approximately 1585, the Balbi family company expanded into the banking business, through which they provided loans to the government and private businesses. In contrast to the philosophy of the nobility at that time, if there were difficulties with payment and the potential loss was not great, they forgave the debt. The Balbi business philosophy was characterized in a letter in which they said that regarding credit, if you treat others well, you will in turn be treated well. The younger Balbis maintained a business presence in Antwerp, Belgium and their activities related in part to the purchase and management of large farms where sheep were raised for the family's wool business. In the 1640s and 1650s the Balbi family established new companies that related to the mining of mercury that was used to refine silver discovered in the Americas. Although they had not anticipated doing so, between 1620 and 1660 the Balbi family maintained a business presence in Milan. Stefano Balbi was responsible for the financial functions of the Milan government. He also administered trusts for the business sector, similar to an investment company. He was recognized as an important "private gentleman" identified with the protection of the republic. In the 1646 -1648 time frame the Balbi wealth increased greatly, due to the management of Monte San Carlo Bank in Milan that related primarily to the lending business. In 1654 the Balbi family sold the management of Monte San Carlo to the city of Milan. Today there is still a bank in Milan by that name. 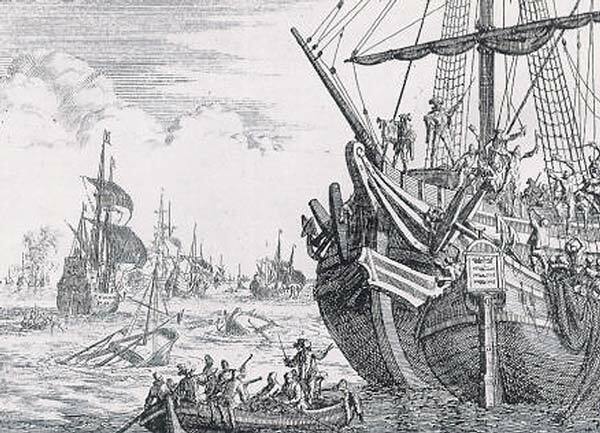 This is a copy of an engraving of a Balbi ship contributed by Gerard de Balby de Vernon, of the French Balbi branch, originally from Genoa, Italy. 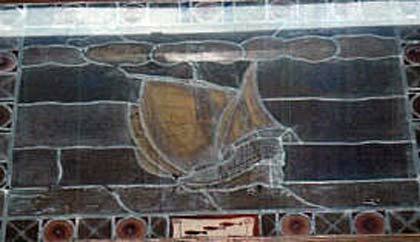 There is an insignia three fish on the bow of the ship. 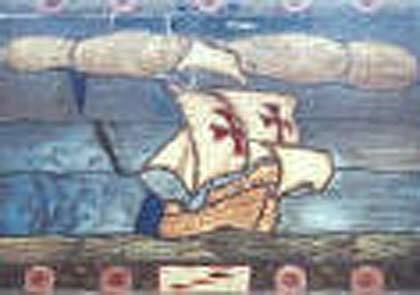 Ship at sea, flying flag of Genoa, three fish at bottom. Stained glass window. Ship at sea, three fish at bottom. Stained glass window.